Not all can do great things, but all can do things with great love. 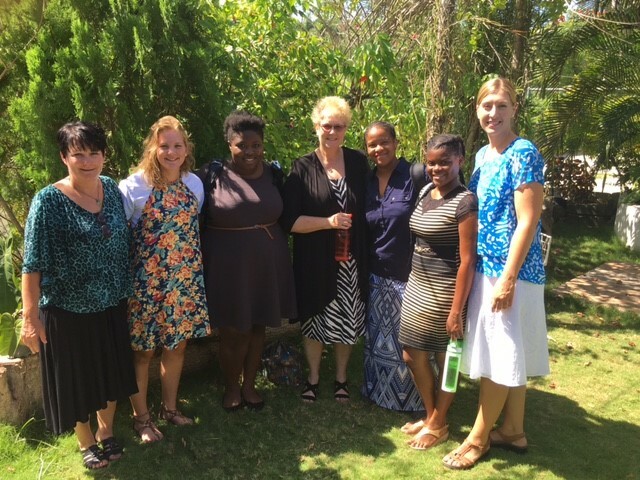 Lori Schaust, an RN at Sojourn was given the opportunity to go on a mission trip to Montego Bay, Jamaica through the nonprofit organization, Declare Ministries. While her adventure was personally a life changing experience, we feel not only inspired, but also have the desire to share her experience after hearing her story. Have you ever been on a mission trip before? Yes, my first mission trip was in 2011 to New Orleans as a chaperone for a group of kids from my church. It was that trip that helped me realize that I needed more than just “practicing” my religion at church on Sundays. What was your biggest accomplishment while on your mission trip to Montego Bay, Jamaica? Our biggest accomplishment was putting on a children’s ministry (AKA Vacation Bible School) for 5 nights in the rural community of Hampton at Full Gospel Tabernacle Assembly of God. How many individuals were in your group? There were 5 of us from MN / South Dakota and 2 awesome and beautiful young women from Jamaica on our team. It was extra special because my daughter, Sydney and my niece, Erica were part of this team and could experience their first mission trip. What did you do on a day to day basis? During the day, we prepared for the children’s ministry we would lead that night. We reviewed lessons, practiced songs, prepared a message and skits, and strategized a “call to action” for the children. We gathered supplies and materials for each child to complete a craft project. We put on the children’s ministry 5 nights in Hampton, one morning in Hurlock and one morning in Spring Mount – two other rural communities. On Sunday morning, we went to 2 church services and Sunday evening we were part of the adult crusade in Hampton where we shared our faith and testimonies with the adults and ministered to some. We spent our “off” day at the beach, resting, swimming and snorkeling. Describe the culture and environment. Montego Bay sits right on the ocean. Tourism is big business in Montego Bay and a big source of employment. 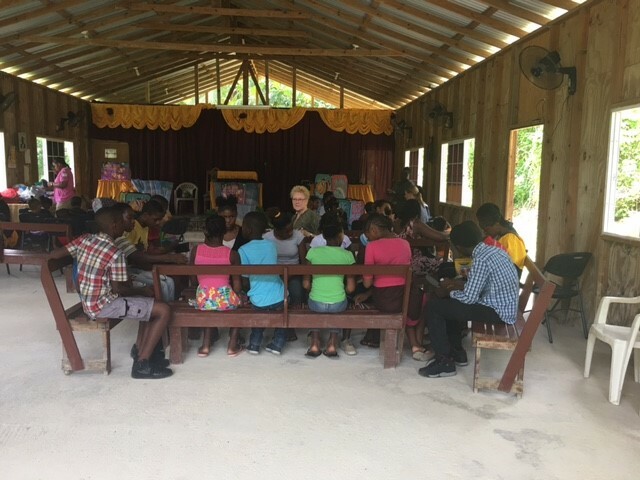 We stayed in a private residence in Montego Bay but our ministry primarily occurred in rural communities geographically located inland, up in the mountains. Communities included: Hampton, Hurlock and Spring Mount – each about a 45-minute car ride, up the mountains via a one lane, dirt road. The culture in Jamaica is more laid back than we experience in the USA. People are not in a rush, they are not tied to the clock or to a rigorous schedule. They get there when they get there and things get done when they get done. There is a lot of poverty, crime and unnecessary violence. There are issues with excess garbage, litter and accessing clean water in rural areas. Transportation for those that live in rural areas is very challenging and just getting to Montego Bay from the outer, rural areas involves negotiating a couple different route taxis / buses and takes a good chunk of time. Most folks do a lot of walking and many walked a good distance to attend the nightly crusade at Hampton Full Gospel Tabernacle Assembly of God. What traditions did they have? There is a lot of poverty – yet a lot of pride. Ladies come to church in dresses, heels and hats; men come in suits and shiny shoes. Every child in Jamaica must be “christened” to be able to start school. They build their houses as they have the money to do so, adding additional rooms when they can. Houses have poured concrete walls, tastefully decorated with modern furnishings. They celebrate black history month (February), Heroes Day and Emancipation/Independence Day. What advice would you give someone going on a mission trip? Just do it! You will not regret it and it will change you. Act like a sponge and soak it all in. It’s a wonderful learning experience! Overall, what was your favorite part of the trip? The CHILDREN, who are beautiful and innocent, kind, loving and resilient… who now know (if they didn’t before), that there is a God who loves them. What other ways are you involved in the community? My goal is to have more awareness of the “mission field” that surrounds each of us daily and to find the boldness to step out to help and minister to others daily on their journey. Thank you, Lori, for sharing your journey. Your faith, love and nurturing personality and passion are what makes a difference in the world around you. We see a bright future of you inspiring others within our community.